Vietnam's five-yearly Communist Party Congress opens tomorrow with a fierce contest expected as Prime Minister Nguyen Tan Dung challenges current party chief Nguyen Phu Trong for the top post. Mr Trong, 71, a conservative with a reputation for being quiet and scholarly, is expected to be re-elected party general secretary, the most powerful post in the country. Still, not many are willing to write off the popular Mr Dung, 66. 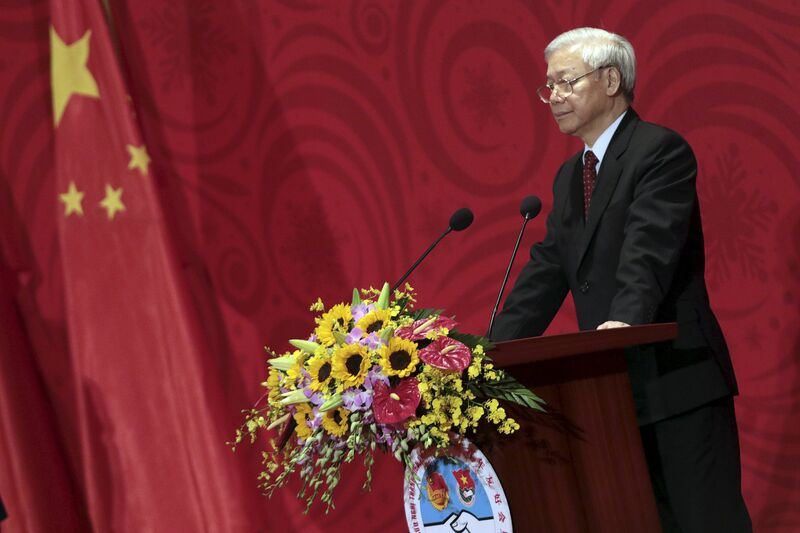 He believes in increased trade and economic ties with the West to balance Vietnam's surging trade deficit with China. "He was the leading voice in the passage of the Trans-Pacific Partnership (trade pact) and is definitely more pro-US, pro-West than Trong," said Professor Zachary Abuza of the National War College in Washington. During the flap with China in 2014, when a Chinese oil rig was placed in waters claimed by Vietnam, Mr Dung was the most outspoken leader, taking a hard line that went down well with the people. Mr Trong and Mr Dung are "polar opposites", Prof Alexander Vuving at the Daniel K. Inouye Asia-Pacific Centre for Security Studies wrote in The Diplomat on Saturday. "Trong is a mandarin, while Dung is a capitalist; one is loyal to his principles, the other to his profits. This personality contrast is one of the reasons for the severity of their clash," Prof Vuving said. One reason Mr Dung is said to want the top post is that if he is not party chief, he would probably have to retire. Deputy Prime Minister Nguyen Xuan Phuc, a protege, would succeed him as prime minister, but Mr Dung himself would be out of power. He has survived talk of corruption and nepotism to serve two terms as prime minister, a post just below that of general secretary. "There is some ego involved and certainly he is out to protect the interests of his friends and family," Prof Abuza said. Mr Dung's two sons are in provincial-level party politics, and one daughter is in the public sector. "But he does have a fundamental vision for moving the country forward and he says Trong is holding the country back. There's always been charges of nepotism... but it doesn't mean he is not committed to economic reform. No one has pushed for privatisation of state- owned enterprises as hard as him." The fight in the normally opaque one-party communist state has spilled over into social media. The social media chatter has drawn a warning from the deputy minister of information and communications that the public should be wary of disinformation. If Mr Trong continues as party chief, analysts do not expect any dramatic change in the direction of Vietnam - or in its policy towards China, which is essentially to balance the increasing assertiveness of its northern neighbour with warming ties with the United States. Indeed, Mr Trong himself evolved in the role. When he became general secretary in 2011, he was widely seen as pro-China, but last year, he met President Barack Obama at the White House. Mr Obama is due to visit Vietnam in May. The TPP was passed under Mr Trong's watch. Singapore-based Mr Chan Jin Lai, a country risk analyst with BMI Research, said in an interview: "We see no reason for new leaders to divert from current economic policies." Those policies have enabled Vietnam - despite some ups and downs - to close 2015 with fourth-quarter gross domestic product the highest in five years, rising 7.01 per cent compared with 6.9 per cent over the same period in 2014. "Vietnam's economic engine is fuelled by a rapidly emerging middle class and no change in Hanoi is likely to disrupt the stable growth that has marked recent years," said Mr Chan. Mr Trong, has a reputation for being quiet and scholarly. In 1981, after years of involvement in the party’s ideology and propaganda, some of it editing the party journal Communist Review, Mr Trong went to the Academy of Social Sciences in the then Soviet Union where he earned a history degree. As secretary of the party’s Executive Committee for Hanoi from 2000 to 2006, he was essentially the head of the city authority. In 2006, he was elected chairman of the National Assembly, and in 2011 he was elected general secretary of the Party, becoming part of its now 16-member Politburo. Mr Trong, initially thought to be pro China, made history in July 2014 when he visited the US, meeting President Barack Obama at the White House. "Trong’s said to be quite simple and clean," a Vietnamese researcher who asked not to be identified told The Straits Times last year. "So far there has been no major scandal." Mr Dung has weathered talks of corruption and nepotism to serve two terms as Prime Minister, a post just below that of General Secretary of the Communist Party. His chances of being elected Secretary General of the Party - the most powerful position in the country - at the 12th Party Congress from Jan 20-28 are seen as dim but not ruled out. Mr Dung is from the south and has proven to be a popular politician in a country where politicians do not commonly campaign amongst the population. 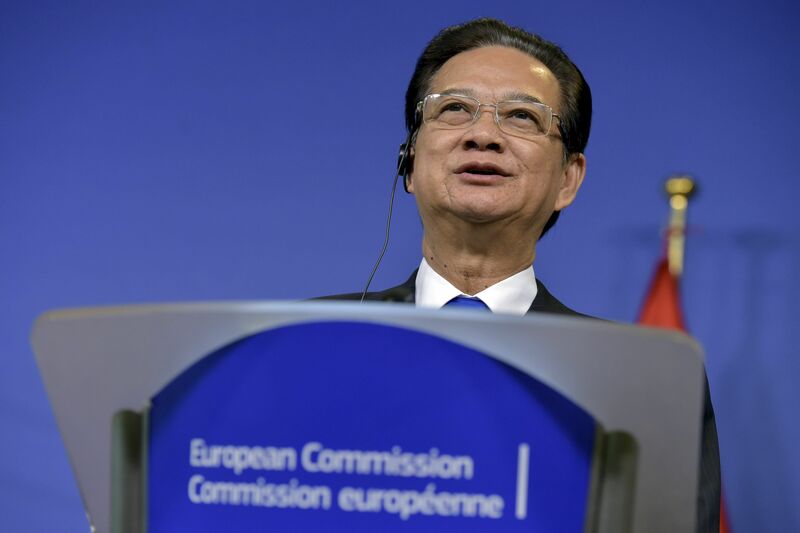 During the 2014 flap with China when Beijing placed an oil rig in waters claimed by Vietnam and there were clashes between Vietnamese and Chinese vessels in the area, Mr Dung made the most forceful statements about China. He has also been a leading advocate of greater engagement with the west and diversification of exports, and is credited with having led Vietnam to sign the US-initiated Trans Pacific Partnership (TPP).